Home to a number of notable families, the estate is an example of 18th and 19th century taste and style. For centuries, Moscow was surrounded by country estates that sustained the Russian heartland with their produce and culture. Indeed, the country estate became an important symbol of Russian culture during the 18th and 19th century. Massive social transformation and the spread of metropolitan Moscow engulfed many of the estates that managed to survive the destruction of the revolutionary years, yet for all the losses, some Moscow area estates still exist in remnants of their former glory. One of the most picturesque of these relics is the estate of Bykovo, also referred to as Marino. Located southeast of Moscow in the Ramensky region, Bykovo is nestled within contemporary housing and dacha areas, but its spacious, forested park is an oasis untouched by development along the small Bykovka River. In 1704, the village was granted by Peter the Great to Illarion Gavrilovich Vorontsov (1674-1750), whose descendants would play a major role in Russian political life and had numerous estates of their own. By the 1760s, Bykovo had changed hands and was granted to Mikhail M. Izmailov (1719?-1800), who supported the 1762 coup that elevated Catherine II (the Great) to the throne. To get to the Bykovo estate take a regular bus from Moscow (Vykhino bus station) #424. The trip takes 40 min. Izmailov held many important state positions in Moscow, among them the director of the Kremlin Office of Construction. In that capacity he worked with two of Russia’s most distinguished architects, Vasily Bazhenov (1737-99) and Matvei Kazakov (1738-1812). Both Bazhenov and Kazakov were superbly gifted interpreters of Neoclassicism, but they also indulged in vivid displays of the pseudo-Gothic style, most notably at the imperial estate of Tsaritsyno, on the southern outskirts of Moscow. Izmailov was no doubt intrigued by Bazhenov’s work at Tsaritsyno, and at Bykovo-Marino he chose a similar style for a church to memorialize his wife, Maria (Naryshkina), who had died in 1780. The resulting masterpiece, the Church of the Vladimir Icon of the Virgin, was completed in 1789. Although specific documentation is lacking, the stylistic flair of the Vladimir Church points to Bazhenov as the author. As with his work at Tsaritsyno, the overall design combines the pseudo-gothic style with an oval Baroque plan for the main sanctuary. There are few more remarkable visions in the Moscow area. The Bykovo church ascends in rich, curving forms decorated with finials, spires, lancet windows and stone carvings, including heads of the apostles. The use of limestone rather than brick as the basic construction material was unusual during the 18th century and creates a medieval aura for the façade details. The church is divided into two levels, with the ground level containing an altar dedicated to the Nativity of Christ in honor of the earlier wooden church on the estate. This lower level has been restored for worship. The main church above, with its altar dedicated to the Vladimir Icon, is reached by a sweeping staircase that provides a dramatic base for the flamboyant upper structure. The west façade and main portal are flanked by symmetrical towers, at least one of which formerly housed bells. Currently under restoration, the spacious interior of the upper church was refurbished in the 1830s by the architect Ivan Tamansky. Its central space was defined by Corinthian columns and decorative Renaissance arches that supported a domed ceiling. The appeal of this “Gothick” style continued in the 19th century, and in the 1830s the Vladimir Church was deftly complemented by Tamansky's design of a separate bell tower a short distance to the west. Intended as a campanile, this tall limestone structure also suggests the tower of a medieval castle. To the east of the Vladimir Church, a path descends to the estate park, now much overgrown. Considerably diminished from its original elegance, the park centers on a picturesque landscape pond reflecting a graceful pavilion in the form of a neoclassical rotunda. The path around the pond rises through the forest to the other main component of Bykovo, the grand estate house. Also attributed to Bazhenov, the original Izmailov house was rebuilt in the 19th century. Mikhail Izmailov died without heirs in 1800, and the Bykovo estate ultimately reverted to the Vorontsovs, related by marriage to another branch of the Izmailovs. Of particular note was the marriage of Illarion Ivanovich Vorontsov (1760-90) to Irina Ivanovna Izmailova (1768-1848). They had one son, Ivan Illarionovich Vorontsov (1790-1854), and by royal decree in 1807 this line of the family became the Vorontsov-Dashkovs. The Bykovo estate passed to his son, Count Illarion Ivanovich Vorontsov-Dashkov (1836-1916), distinguished for his state service and one of the wealthiest landowners in Russia. In 1850s he had the Bykovo palace rebuilt by the architect Benard de Simone (1816-1900), a Swiss native trained at the Imperial Academy of the Arts in St. Petersburg. 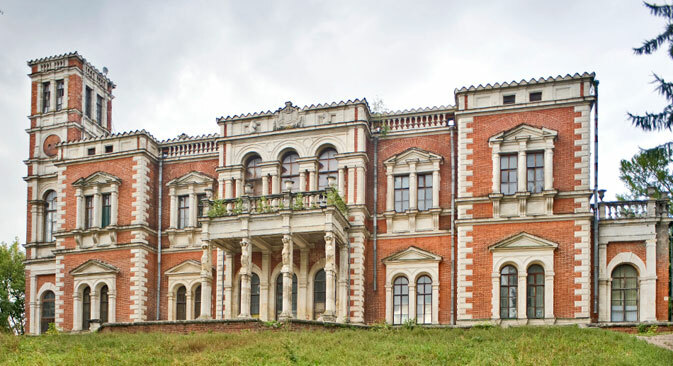 Completed in 1856, the palatial Bykovo manor is an excellent example of the neo-Renaissance style, with red brick walls and limestone decorative details. The main entrance, on the north façade, is framed by a ramp with a balustrade. The west side façade is marked by a tall attached tower that provided panoramic views. Most impressive, however, is the park façade, which centers on a massive portico adorned with four statuesque caryatids – statues of Greek maidens. The broad terrace extending from the façade has been poorly maintained and shows signs of vandalism. But it still opens onto a stunning view of the south park, with a clear slope descending to the forest. The Vorontsov-Dashkovs resided primarily in St. Petersburg, and in the 1880s the Bykovo estate was sold to a wealthy engineer, Nikolai Ilin. After the Revolution, the estate manor passed among a series of institutions and eventually became a tuberculosis sanatorium. With no clear mandate for preservation, the collection of artwork disappeared, as did the interior furnishings. The grand structure is now closed. Although its future remains uncertain, it still stands without the devastating decay that has ruined other country estate houses over the past few decades. In any season of the year, the Bykovo estate is worth the effort of a visit.